This race came out of a certain Star Trek TNG episode and the quote "Ugly bags of mostly water." Alas some changes to the pending Celtris campaign setting meant that psionics just were not going to work, and as a consequence the psionitrix race fell to the the cutting laptop floor. However that does not mean the psionitrix must suffer in darkness. For your reading and gaming pleasure, TFPC's blog presents, the Psionitrix. It is unknown how or when the psionitrix first came to be, but given their suspected great longevity it is likely in the distant past. Psionitrix are can be mistaken for strange but normal crystal formation, as they often live among their unintelligent counterparts. It is exceedingly rare to come into contact with a psionitrix as they avoid most organic humanoids. They will normally only reveal themselves to other psionic beings, and even this is rare. Also, because of their unique physiology, they do not build great cities or farm the land as other races do. Psionitrix tend to settle anywhere there is abundant sunlight and few other intelligent creatures. Some go as far as to found their circles among natural crystal formations to better disguise their presence from others, and perhaps out of a strange sense of guardianship over their mindless cousins. Physical Description Psionitrix are composed of many crystals radiating out from their center in every direction creating a roughly spherical shape. 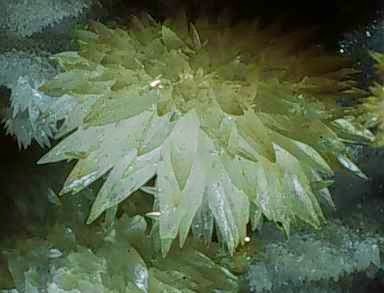 Psionitrix are made up of hundreds if not thousands of individual crystals both large and small. They can be of any color, but most commonly they are clear or smoky gray much like quartz. Psionitrix constantly shine with an inner light and sparkle as if in sunlight even in complete darkness. Because of their crystalline nature psionitrix grow slowly and can live for hundreds of years. Society Psionitrix society is quite different from many humanoid ones. Because of their limited needs, they usually live in natural caverns and crags or other secluded natural locations. Normally these settlements, called circles, are made up of between twenty and fifty individual psionitrix. The circle is lead by the eldest psionitrix, usually but not always, who is of a psionic class. This leader is referred to as the central, and is supported by the inner circle, which is made up of the eldest from among the protector, sculptor, scholar, and stonekin sub-circles. Each of these sub-circles is responsible for a different aspect of psionitrix life. Protectors defend the circle and its home territory. Sculptors ensure the circle has access to sunlight and create any item a circle member might need. Scholars record the circles history, philosophies, and often practice the Unseen Way or the Art. Lastly the stonekin tend to the needs of the circles home territory and its recourses, and the preservation of its natural state. Relations Psionitrix tend to avoid contact with organic creatures, however meetings do occur between them and humanoids. Dwarves do come across psionitrix in their delving, and meetings between the two races seldom go well, as the dwarves often mistake psionitrix for unintelligent but unique crystal, and harvest them as such. Because of this, psionitrix settle well away from dwarven populations and are suspicious of them as a whole. Conversely other psionic races and creatures find it somewhat easier to deal with psionitrix, as they are more open and forthcoming with those who also practice the Unseen Way. Psionitrix are often on good terms with other lawful or neutral beings whom also posses the earth sub-type. Alignment and Religion Psionitrix tend towards neutrality, lawful neutral or true neutral being most common, as their society is orderly but takes little notice of the endless conflict between good and evil. However psionitrix can be of any alignment as they show a range of personalities and outlooks just as all sentient races do. Religion also varies but nature worship (green faith) or worship of earth deities is most common. Adventurers It is even rarer still to encounter a psionitrix as a lone adventurer than it is to meet one at all. Sadly when a psionitrix is found away from the circle it most often means the circle is broken and its members dead. Because of their social structure lone psionitrix feel the need to “fit in” to a hierarchy and work towards common goals. Once a Psionitrix see’s their fellow adventurers as their new circle, they tend to become quite attached and willing to fight to defend them. It can take quite some time for a psionitrix to accept organic circle mates, but their loyalty is unyielding once they do so. Names Psionitrix names when translated into spoken language tend derive from the individual’s coloration and sub-circle. For example a luminescent green stonekin circle druid might be called Jade Tender or Emerald Sheppard, where as a deep blue protector fighter might be Bold Sapphire or Azure Everwatch. +2 Intelligence, +2 Dexterity, +2 Wisdom, and -4 Strength: Psionitrix are smart, quick, and wise, but their small size and ectoplasmic limbs makes them weak. Aberration: Psionitrix are of the aberration (earth) subtype. Small: Psionitrix are Small creatures and gain a +1 size bonus to their AC, a +1 size bonus on attack rolls, a –1 penalty to their Combat Maneuver Bonus and Combat Maneuver Defense, a +4 size bonus on Stealth checks, and a +2 on Fly checks. Natural Levitation: Psionitrix have a natural fly speed of 40 ft. (good) If using ectoplasmic limbs to walk, their land speed is 20 feet. Vibration Sight: Psionitrix have tremor sense 60 feet. Naturally Psionic: Psionitrix gain the Wild Talent feat as a bonus feat at 1st level. If a psionitrix takes levels in a psionic class, he also gains the Psionic Talent feat as a bonus feat as well. Psionic Aptitude: When a psionitrix takes a level in a favored class, he can choose to gain an additional power point instead of a hit point or skill point. Alien Makeup: The strange appearance and nature of the psionitrix can affect the reactions of those nearby. A psionitrix takes a -2 to all charisma based skill check when dealing with non-psionic organic races. Photosynthetic: A psionitrix does not need to eat as organic creatures do, however in order to maintain their existence; a psionitrix must be exposed to sunlight for at least 3 hours each day. A psionitrix still must rest as normal to regain power points or spells and avoid fatigue. Ectoplasmic Limbs: Psionitrix have the ability to create humanoid limbs from ectoplasm, appearing as semi-transparent and often the same color as the psionitrix. As long as the psionitrix has at least one power point in reserve they may create up to two limbs in any combination they wish. These limbs remain unless destroyed or the effect is ended by the psionitrix. Additionally if the psionitrix spends one psionic strength point they may create an entire humanoid frame from ectoplasm, this ectoplasmic body lasts for one hour. This duration can be extended for one more hour per additional psionic strength point spent. The psionitrix’s ectoplasmic limbs and frame are ectoplasmic psionic constructs and follow all the rules and restrictions of such. Crystal Body: Because psionitrix are of a crystalline nature, they gain natural armor +4 but also are vulnerable to sonic damage. Psionitrix are also subject to spells, spell-like abilities, and special abilities that specifically affect stone or crystal. Also due to a psionitrix’s crystal nature they have a natural slam attack of 1d3+Strength, this slam is considered bludgeoning and piercing damage and a crit range of 20x2. Languages: Psionitrix do not communicate as organic beings do, as among themselves they use a complex series of lightning fast flashes to convey ideas. They however also have natural telepathy and may communicate with any intelligent creature that posses language within 100 ft. of themselves. Some psionitrix have learned that their own bodies are the best weapon of all. Benefit: This feat allows you to as a standard action create weapons directly from the crystal of your body. Creating a weapon in this way does not provoke attacks of opportunity. By spending one psionic strength point you may sculpt from your body any melee weapon you are proficient with. The weapon is part of your body and remains in its current from until destroyed or the effect is ended. The weapon is in all ways identical to the normal version of the same weapon save that any sunder damage taken by the crystal weapon is subtracted from your hit points and do not add to your weight carried for the purposes of encumbrance. The weapon created has the hardness, hit points, and special affects/restrictions of common crystalline weapons. The weapon is size small, and follows all normal rules regarding applying feats, applying spell/psionic effects, reach, and combat maneuvers. Even if the weapon created can normally be thrown, (such as a dagger), you may not use it as a thrown missile weapon unless you have the crystal missiles feat. You may manifest a weapon in your “off hand” in this way as well, and suffer all penalties for doing so and apply all feats normally. The hard and sharp crystals of your body make excellent projectiles, and you have learned to use them as such. Benefit: You have learned through long hours of practice to sacrifice a little of yourself to create thrown missile weapons or ammunition from your crystalline body. You may create any missile weapon ammunition or thrown weapon you a proficient with, and do not need to have limbs to wield it normally. Because these missiles are created from the crystal of your body, they have the hardness, hit points, and special affects of common crystalline weapons and ammunition. Each time you use this feat you take one point of damage and in exchange receive 10 thrown missile weapons or arrows/bolts/sling bullets that you may use normally. These projectiles function in all ways like a normal weapon of the type, including provoking attacks of opportunity when appropriate, reload times, and applying feats or spell/psionic effects. When using bow, crossbow, and sling type weapons, only the ammunition is created from your substance. All missiles created using this feat appears to fire directly from your body without need for a visible launcher or limb to throw them. It should be noted that in the case of thrown weapons that may be used in melee, you must have the crystal armory feat in order to use them in that way. You may automatically apply your strength modifier to arrows and sling bullets as if fired by a mighty weapon keyed to your current strength score. Varied and wondrous are the forms of nature, and you have mastered the art of sculpting your ectoplasmic limbs into more than just humanoid arms and legs. Benefit: You may create two tentacles, two clawed or taloned limbs, a tail, a fanged maw, a horned head, two pincers, or four hoofed legs. These limbs follow all the same rules as normal ectoplasmic constructs, but do grant you the corresponding natural attack or attacks for the limb(s) created; the damage is that of a small creature. Your control over hour ectoplasmic from surpasses all others, as you can craft a body to mimic nearly any organic creature. Benefit: Using this feat when you create an entire ectoplasmic body, that body may be of any type, such as quadruped or serpentine, or in a combination of body types to form a hybrid. Additionally if you spend 2 psionic strength points instead of one the ectoplasmic form you create allows for forms as per alter self. Maintaining this ectoplasmic form requires you to spend 2 psionic strength points per hour instead of one. The sun is more than just sustenance to you, absorbing its rays can restore your psionic strength as well. Benefit: During the three hours each day you absorb sunlight as others eat meals, you gain not only sustenance as normal, but also twice your class level or hit die worth of psionic strength points, up to your normal max. You receive a third of this total pool rounded down at each “meal” during the course of the day. Unless denied sunlight specifically during a given part of a day this repast occurs when others break trail bread and chew jerky. You have learned the coveted secret of using the solar energy within you as a potent weapon. Benefit: A number of times equal to 3+ your manifestor stat bonus per day you may unleash some or all of the psionic strength points you have received from your “meals” as a ray of yellow flame. This ray deals 1d4 fire damage per psionic strength point spent and affects creatures that are sensitive to light as if it were bright sunlight. This ray has a range of 30 ft. and requires a ranged touch attack. Through the solar meditation feat these point are built up over the course of a full day, and you may not use psionic strength points not gained from solar meditation in this way. Also you may only spend points you have already added back to your total, this pool should be noted separately, but you still may use these psionic strength points normally if you wish. Your crystalline body channels psionic energy easily as you are made of what organics call deep crystal. Benefit: Your slam attack and all weapons you create from your body function as the deep crystal special material.